The Situation: The Hong Kong Stock Exchange’s failure to recognize that investors are able to evaluate biotech companies in the pre-revenue stages, and its consequent refusal to list those companies for trading, is viewed by many in the modern investment environment as outmoded. The Development: With certain restrictions and safeguards, new chapters to the Main Board Listing Rules will allow for the listing of pre-revenue biotech companies as soon as mid-2018. Looking Ahead: The new rules will expand the existing listing regime to attract "new economy" companies, primarily those in the biotech sector. On December 15, 2017, The Hong Kong Stock Exchange Limited announced the consultation conclusions to the "New Board Concept Paper" published on June 16, 2017 ("Conclusions"). The Conclusions set out the steps to be taken by the Hong Kong Stock Exchange to introduce two new chapters to the Main Board Listing Rules. Once the rules are in place, the introduction of the listing of pre-revenue biotech companies and companies from emerging and innovative sectors that have "weighted voting rights," or WVR, structures (subject to additional disclosure and safeguards) will have the effect of expanding the existing listing regime to attract and facilitate the listing of "new economy" companies, particularly that of the biotech sector. "Biotech companies" are defined as "companies engaged in the research and development, application and commercialization of products, processes or technologies in the biotech sphere." They are selected as the only target group, among the "new economy" companies, for what primarily can be considered as a class exemption for pre-revenue companies. Under the changing global business dynamic that drives companies to pursue market share before profit, many businesses involved in research and development ("R&D")-intensive sectors, notably the biotech sector, have legitimate capital markets demand ahead of having a revenue-generating commercial product and service. Given the market has demonstrated elsewhere that it is capable of assessing and valuing biotech companies, Hong Kong's failure to acknowledge this within the existing listing regime was seen as outmoded. The focus on biotech companies is a response to the strict regulation (e.g., by the U.S. Food and Drug Administration) on the biotech sector, which puts biotech companies under a regime that sets external milestones on development progress, as well as the fact that biotech companies make up the majority of candidates seeking list in the pre-revenue stage. This expansion is likely to provide investors with a frame of reference in accessing the value of companies that does not fit in the traditional indicators of performance (e.g., revenue and profit). Has been in operation in its current line of business (for example, R&D in biotech) for at least two years prior to listing. For purpose of ensuring investors are fully informed of the business and R&D risks involved, biotech companies are also required to provide: (i) enhanced risk disclosures; (ii) disclosures on the phases of development and the potential market of its product(s); (iii) disclosure of details of spending on R&D; (iv) patents granted and applied for; and (v) the R&D experience of management. 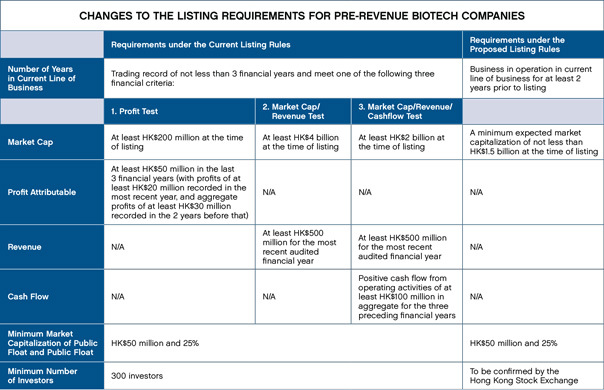 See the table below for a comparison of the current listing requirements and the proposed listing requirements on pre-revenue biotech companies. "We May Have Missed Some Big Players, but It Is Not Too Late." The Conclusions undoubtedly demonstrate the unprecedentedly strong determination of the Hong Kong Stock Exchange in opening up the stock market. The decision to enable pre-revenue biotech companies to be listed on the Main Board is no doubt a milestone in the history of the market, establishing no better start for further market development in capital raising for many years down the road. It is expected the implementation of the Conclusions would envisage a significant number of "new economy" companies (including high-quality players in the biotech sector) choosing Hong Kong as their platform for fund-raising as a result. The Hong Kong Stock Exchange will continue to fine tune the new regime through further market consultation, and it is generally expected that the new rules would be in place by mid-2018. The decision to allow pre-revenue biotech companies Main Board listing is a milestone for the Hong Kong Stock Exchange. Listing is subject to certain conditions regarding market capitalization, R&D engagement, expectations of product or technology commercialization, and evidence of a product, technology, or process advancing beyond the concept stage. Additional requirements include enhanced risk disclosures and details relating to R&D spending.